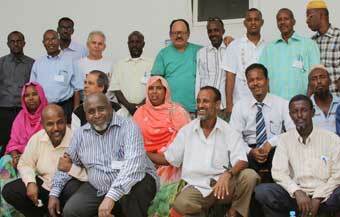 Members of the Sudan Policy Forum at the end of their two day delibration on livestock projects for the country's poverty eradication strategy paper. 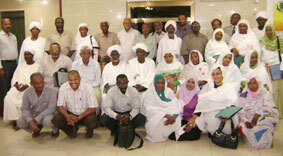 The Sudanese Livestock Policy Forum was held on the 28th and 29th July 2010 in Khartoum, the Sudan. The members of the forum discussed viable projects submitted from different states of the Sudan, with the aim of augmenting the profile of livestock in the Sudanese country poverty eradication strategy paper. Opening the two day session, the State Minister of Animal Resources and Fisheries underscored the need to focus on the significant roles the livestock sector is playing to alleviate poverty and food security in the Sudan and across the IGAD region. Likewise, the Djibouti Policy Forum had also conducted a similar meeting on 21st July, 2010 in Djibouti on the National Initiative for Social Development (INDS). The meeting, which was officially opened by Dr. Musa Ibrahim, Director of Livestock Department at the Ministry of Agriculture, Livestock and the See, discussed on possible project proposals and entry points for incorporation into INDS. Mr Abdalla Barkhat, the IGAD LPI National Technical Focal Point, and Dr. Abdi Jama of IGAD LPI also visited the Secretariat of State for National Solidarity and the Ministry of the Economy, Finance, Planning and Privatization, which is in charge of the overall supervsion of the development of INDS. The team met with the experts and got an update on the new phase of INDS in Djibouti an explored entry points for the contributions of the Livestock Policy Forum of Djibouti. Both Policy Forums, which were formed by IGAD LPI, consist of representatives from government ministries, pastoralist unions, civil Society organisations, women affairs, NGOs and the private sectors.